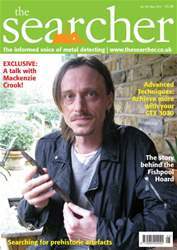 This month we have an EXCLUSIVE interview with actor (and detectorist) Mackenzie Crook who is writing and starring in a TV series later this year on the BBC called ‘Detectorists’. We also have the first in a two part article on Advanced Techniques for those who own a Minelab CTX 3030. There is a report on a group of beautiful Angle Saxon finds from Kent, a very rare Bronze Age sickle plus the story behind the famous Fishpool Hoard currently on display in the British Museum. All this and much, much more!